To Rent Or Not To Rent ...That is the Ski Question - Ski. Play. Live. 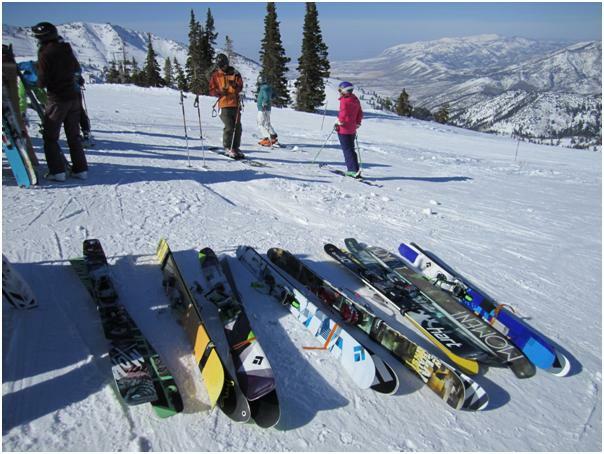 Skiers and boarders often make excuses why NOT to rent skis when they go on vacation. You trust yours. The rental shop won’t have the quality or length you expect. You hate standing in line on your first day out. You paid good money for your skis and you want your money’s worth back. But if you plan ahead those reasons are moot. Call around and you can find your perfect pair at a price that might outweigh the cost of shipping or checking your old sticks. Let’s face it. If you’re hauling around a 10+-year-old pair of skis, go ahead and let the airline lose them. Even this year’s low-end rentals outperform those clunkers. Yeah, $50 a day for demo skis may sound steep – it is! But you can get by with “sport skis” for $30 right? What about $40 a day if it meant your kids’ rentals were free and you got a free lunch? With Rentskis.com you can do just that. At first I thought I wouldn’t write about this. After all, it sounds like I’m advertising for them. But as a ski instructor, I see hundreds of rentals go out every day. Wouldn’t you want to know if you could get some extras thrown in? I would. Most rental shops let you swap out and try a variety of skis while you rent from them; you can leave them for free overnight storage during your stay; keep them waxed and tuned every day. Rentskis.com sweetens the pot by offering free delivery (no standing in line at 8 a.m.), free kids rentals and $15 lunch vouchers at Vail, Beaver Creek, Keystone, and Breckenridge in Colorado; Heavenly, Northstar and Kirkwood in Tahoe region; Canyons here in Utah. The next time you plan that ski vacation make sure you do a bit a of research to see what you’ll save by renting your gear.